Today Im going to explain you how to run a BeanShell Script in Liferay6.1. Just for now consider “If you can code in Java, you can code in BeanShell as well”. I had a requirement to assign some UserGroups to Roles which exists with the same name as UserGroup. I had 1000s of Groups and 1000s of Roles in the System. I was looking to accomplish the task programatically rather than manually. Then came to my rescue is the BeanShell Scripting. Before looking into the code we’ll just see what are the implicit Liferay objects availble in BeanShell. 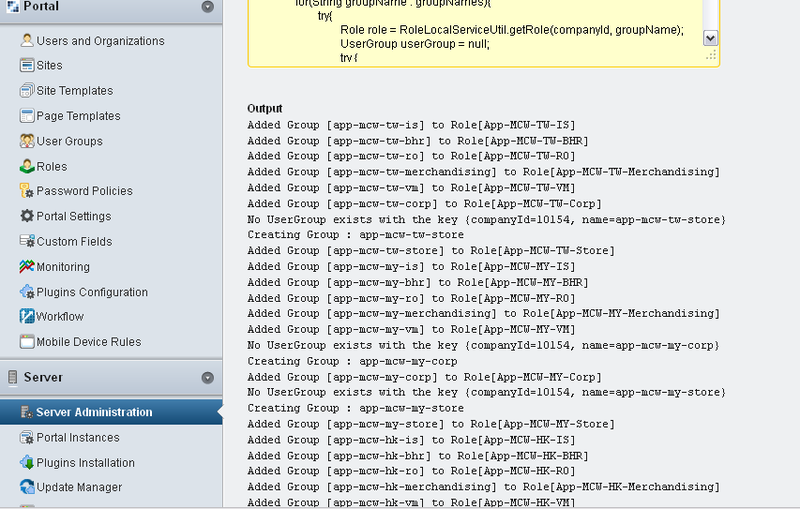 Here is the script to assign UserGroups to Roles. The UserGroup will be created if it doesn’t exist. Select Beanshell in the dropdown list and paste the code.